We've previously discussed how in 1993 Verizon conned the state of New Jersey into giving the telco all manner of subsidies and tax breaks in exchange for a promise to wire the majority of the state with symmetrical fiber. Fast forward to 2015, most of New Jersey remains on aging DSL, and the state decided it would be a wonderful idea to simply let Verizon walk away from its obligations. Of course this isn't new: Verizon's regulatory capture allowed it to do the exact same thing in Pennsylvania, and it's currently busy trying to dodge New York City FiOS build out requirements as well. "Mayor Steven Fulop of Jersey City and Mayor Ras Baraka of Newark are expected to call a press conference to discuss whether Verizon is fulfilling its obligations under the act. Public records show that 21,392 different properties in Newark have waived their access rights under the franchise agreement, opting out of any right to FiOS availability. In Jersey City, that number climbed to 25,311, nearly a fifth of the city’s properties. 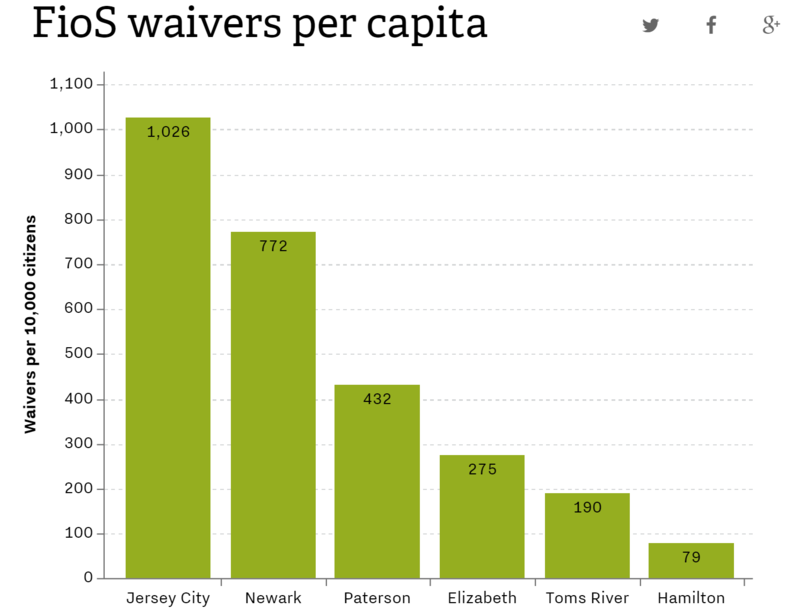 In richer municipalities like Trenton, Weehawken, and Hackensack, that number never climbed above 3,000." "What we understand the practice to be is that, if you're in a wealthy high-rise next to the water in Jersey City, they will bend over backwards trying to get into that building," says Seth Hahn of the Communication Workers of America union, which has supported the mayors in their efforts to get more cable laid. "But if you live on the other end of the tracks, they'll send you a letter saying, 'We'd like access to your building.’" After a labyrinth of phone calls and offerings, the landlord will often end up on a waiver list without realizing it, Hahn says." None of this is to say landlords can't be difficult. In a 2013 PSC filing with the state of New York (pdf), Verizon claims many landlords refused the telco access to building infrastructure, and some even tried to charge the telco for building access. But looking at the data, it seems somewhat obvious that there's a big discrepancy among waiver totals in poorer cities: Now this could be coincidental, but given Verizon's history on this front, claims that Verizon's using landlords as a bogeyman to justify failure to adhere to obligations seem very likely. You'd need to investigate to be sure, but since New Jersey is already pretty lax on holding Verizon accountable, it's painfully unlikely that the state will ever bother. And letting Verizon get away with this kind of stuff isn't unique; this same story plays out in dozens of states nationwide. Repeatedly. But the core of this problem is again regulatory capture and these statewide TV franchise agreements. The new laws were pushed by AT&T and Verizon in dozens of states around ten years ago, and were quickly rammed through by campaign-cash soaked state legislatures under the promise of new jobs and lower TV prices thanks to increased competition. But most if not all of the agreements were written by telco lobbyists and lawyers. As such, most of them are basically phone company wishlists, and in some places like Wisconsin, went so far as to gut all consumer protections and even some eminent domain rights. So yeah, if you didn't realize it already companies like AT&T and Verizon all but own many state legislatures, as evident by the fact they literally write the laws governing their behavior. The end result of that may not be surprising, but the fact that we never seem to learn from decades of this kind of behavior should be. The local review site Yelp has been under fire lately from some businesses that aren't happy with reviews people have written about them, or how they're displayed on the site. Not that this is anything new: people have sued the site for defamation before, while others have tried to game the system to make their businesses look more popular. But now, some doctors are trying to get patients to sign waivers saying they won't post comments about their doctors online (via Information Week). A company has set up a service that provides doctors with the waivers, then monitors review sites for comments about them. If they find a comment on one of the subscribing doctors, they attempt to use the waivers to get the sites to remove it. Of course, most of the comments are anonymous, so it's not clear exactly how they link a particular comment to a particular patient who's signed a waiver, and at least one site has refused to comply. The founder of the service says the only thing that should matter to patients are a doctor's medical skills -- but that hardly seems true. Certainly they play a large role in determining a patient's happiness with their care, but there's the oft-referred-to "bedside manner" that also plays key part. Consumers have the right to as much information about their medical caregivers as they need to feel comfortable, but it can often be difficult to ascertain. That seems to play into doctors' hands, so it's hard to see these attempts to gag patients as little more than a further attempt to stifle anything that challenges the status quo in the world of medicine.